In the last few months the unthinkable has happened. A cable TV channel, one that has been with pay television from the beginning, one widely held as an anchor tenant of the franchise, has decided to launch a standalone OTT service. HBO will begin signing up Internet customers in 2015 without requiring that they have a pay TV subscription. The move by HBO has been greeted with consternation by pay TV operators, though it hasn’t stopped others from following the lead. CBS, Showtime and even ESPN have all made similar announcements. Most, however, have decided to keep their content safely ensconced behind the pay TV wall. What could be inducing cable stalwarts to potentially put the billions of dollars they earn from pay TV at risk by going direct to consumers OTT? This free white paper offers four solid reasons why they are taking the risk. You will hear from industry leaders like CBS President Les Moonves, and Disney chief Bob Iger on what is motivating them to make the leap. These four reasons explain why any cable TV channel can, and should, launch their own OTT TV service now. According to new analysis from nScreenMedia, the leading analyst group covering media’s transition to multiscreen consumption models, 19% of millennials do not have pay TV. Just 2% of those say they intend to get it in the next three months. A big part of the problem for operators is that these young viewers have grown up in the interactive world of the Internet and mobile phones. The passive television experience is simply not interesting to them. The white paper examines successful online services such as HuffPost Live to understand how they are leveraging the voice of their audience to more directly engage with them. Using a mix of editorial material and social comments, HuffPost Live is now attracting audiences similar in size to the traditional 24 hour cable news channels like CNN and MSNBC. 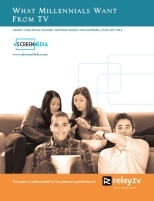 In this free white paper, nScreenMedia looks at how social media is changing the traditional TV experience. It also offers practical advice to operators on how to go about bringing the social dimension to their TV service. According to new analysis from nScreenMedia, the reason Netflix has a 29% penetration in Denmark while HBO Nordic has just 4% is that each service has radically different barriers to adoption. 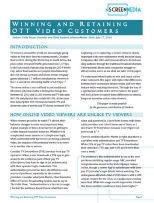 In this free white paper, nScreenMedia looks in detail at the launch of Netflix and HBO Nordic in Scandinavia to understand how the two services could achieve such different results. The white paper examines data which shows clearly that online video viewers simply refuse to bound by the terms of traditional pay-TV. Any barrier placed in their path, such as a login or complicated user interface, will result in them moving on to the next service. Service providers must strive to lower the barriers for consumers to get the content they crave, while at the same time keeping the service profitable and secure. 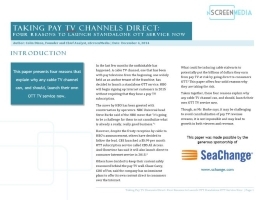 The white paper shows that many of the traditional pay TV approaches don’t work on the web. There are, however, simple things service providers can do now to address many of the issues. Consumers are spending a lot more time online watching video. 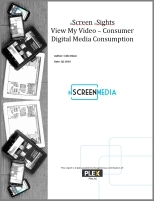 This report examines how this is impacting the balance of consumption between the video sources commonly available; including pay and free TV, DVD and Blu-ray discs, digital media, free and paid Internet streaming services and home videos. The report looks at the group of consumers that have cut the cord, assessing how happy they are with their decision and what they miss the most about pay-TV. Video enabled device preferences are also presented. This report draws on a recent survey of 1000 U.S. broadband users. There are already many native multiscreen delivery services, such as Hulu Plus in the U.S. and Maxdome in Germany. And operators are beginning to adapt to the new environment with TV-Everywhere services. However, with just 6.5% of US pay-TV subscribers using their operator’s TV-Everywhere portal more than once a week, it’s clear there is still a long way to go. There is a section dedicated to each of the topics with a discussion of the challenges and description of the some of the opportunities. Consumers are transitioning from using physical media, such as DVDs and video tapes, to digital media, including MP3s and UltraViolet movies. This report examines this transition through the lens of storage. Digital media must be stored somewhere, and should be backed up. We asked consumers what storage mediums they use for each of the following media types: digital photos, ripped and downloaded music and movies, and home videos. The storage mediums examined in the report include: PCs, smartphones, tablets, external hard drives, social media sites, cloud storage and NAS. With the explosive growth of tablets and smartphones, consumers are naturally using the devices to deepen their engagement with television. From Netflix to Zeebox, Shazam to Viggle, a host of apps have sprung up to service every need of the television viewer. While many app providers talk about their successes, it’s much less clear which apps are hits and which are misses. This report looks at downloads and usage data to expose the winners and losers in the burgeoning new market for second screen TV apps. This white paper delves into this problem in detail, looking for potential solutions to the app proliferation problem. In particular, the paper examines how the cloud approach to app development holds the promise of being the ultimate answer to problem. Just two years ago it would have been unthinkable to launch full pay-TV services over the Internet. Today, with cable stalwarts such as HBO and TNT delivering their quality TV shows direct to consumers over the web, it is clear that the Internet has become an extremely capable television platform. This paper explores some of the advantages of becoming a virtual operator (vPop.) The author spoke with 4 industry insiders about areas where virtual operators may have an advantage. This paper discusses how caching can help broadband networks meet the ever increasing video demands of consumers. To put this topic in perspective, the paper starts with a discussion of how much bandwidth is required to deliver video to primetime sized audiences, and how caching helps reduce the bandwidth required. The discussion shifts to how partner caching and transparent caching differ in their approach to reducing the burden of video on operator networks.